Crazy Eights is a simple but fun card game for two to four players and uses a standard 52-card deck of playing cards. The object is to be the first person to play all of your cards and have the lowest score at the end of the game. After shuffling the cards, the dealer deals seven cards to each player. The cards are dealt one at a time, facedown, in a clock-wise direction. The dealer now places the remaining cards, facedown, in middle of the table. This is the draw pile or stockpile. The players view their own cards as the dealer then turns up the top card of the draw pile and places it next to the draw pile. This is the discard pile, and main area of play. 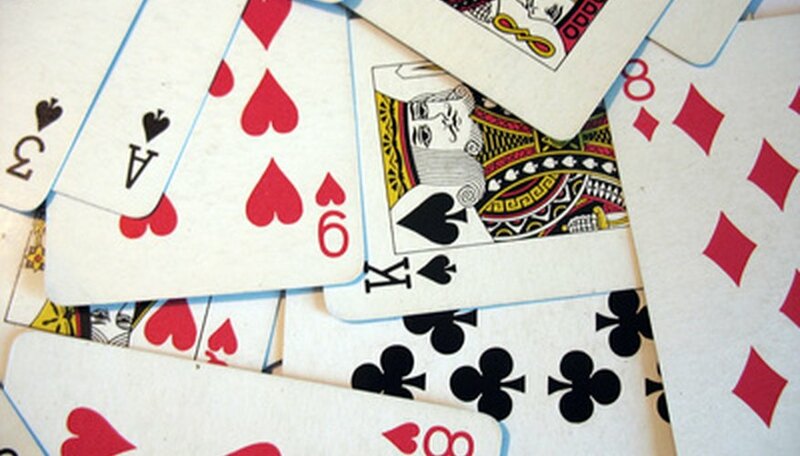 The first player to the dealer’s left must match either the value or the suit of card in the discard pile. Any eight would also be playable because eights are “crazy” and can be used as any suit. The player takes the card from his hand, and laying it face up, covers the card in the discard pile. Play continues to the left with the next player matching the new top card of the discard pile. If a player cannot match the top card in the discard pile, she must draw from the draw pile until she pulls a playable card. The round continues until a player runs out of cards. Now it’s time to score the round. The player who played all his cards receives a zero for the round. The rest of players receive penalty points based on the cards left in their hands. Eights are worth 50 points each. Face cards (kings, queens and jacks) are worth 10 points each, and all other cards are worth five points each. The deal passes to the left, and the new dealer shuffles the cards and deals a new round. Play continues until a player reached 500 points. The lowest score at that point is declared the winner. Play Variation: Players take a single card and pass their turn if they cannot play. In this variation, players end up drawing fewer cards, and the game can go much quicker. Scoring Variation: Instead of scoring penalty points to the players, all points are added together and are awarded to the player who played all of his cards. The other players receive zeroes for the round. The first person to reach 500 points is the winner. Elizabeth McNelis has been writing gardening, cooking, parenting and homeschooling articles from her St. Petersburg urban homestead since 2006. She is the editor of “The Perspective,” a homeschooling newsletter distributed in Pinellas County, Fla. and writes a blog entitled Little Farm in the Big City. McNelis holds a Bachelor of Arts in professional and technical writing from the University of South Florida.